For many, siblings are our first friends, our greatest supporters and even our fiercest rivals! They typically play a special role in our lives, and in many cases, will be key fixtures involved in a couple's wedding day. Traditional wedding etiquette dictates that siblings be honored as bridesmaids and groomsmen, including the coveted Maid of Honor and Best Man roles. However, for less-traditional couples, including siblings as their bridesmaids and groomsmen may not be the right fit – and that’s okay! If you’re seeking an alternative, there are many thoughtful and loving ways to include your siblings in your wedding day, which can minimize the potential for hurt feelings or speculation. Choosing a non-traditional role for your brother or sister may come with some pushback from family, so it’s first and foremost important that both you and your fiancé support each other in your decision. Listen to your partner’s feelings, and when possible, defer to their judgment on their own siblings. Thoughtful consideration of your siblings and elevating them in a unique role should help your family share your vision and excitement. We’ve frequently seen siblings cast as program attendants, guest book hosts, ushers and junior-status bridesmaids and groomsmen (when much younger) – but there are several meaningful ways in which siblings can contribute to your day. Officiant – If your brother or sister is a skilled public speaker, consider asking them to officiate your ceremony. Master Of Ceremony – As your MC for the evening, they can offer transitions throughout special moments, a mini-speech in your honor, help by announcing the bridal party, calling up those giving formal speeches, announcing special dances and keeping the night moving along smoothly. Musical Guest – If your brother or sister is a particularly skilled musician, they may be honored to perform a special song during your ceremony or reception. Dedicated Dance – Is your brother or sister a talented dancer, or is there a certain style of dance special to your family or heritage? They could help get the party going! Special Décor – Consider how his or her special skills – computer design, typography, woodworking, crafting – may contribute to your vision – and be sure to write a special acknowledgement in your wedding program. Unity Ritual – A unity ritual is a beautiful way to incorporate your siblings in a small yet meaningful way. MAE's Tip: A unity ritual example we love is a flower or Tree Planting Ceremony – during which they can offer a bit of soil and new life to represent your merging families. Cultural Traditions – You might draw inspiration from religious and cultural traditions that allow for additional participants. As examples, many Christian ceremonies include candle lighters and gift bearers who process down the aisle and help adorn the altar. 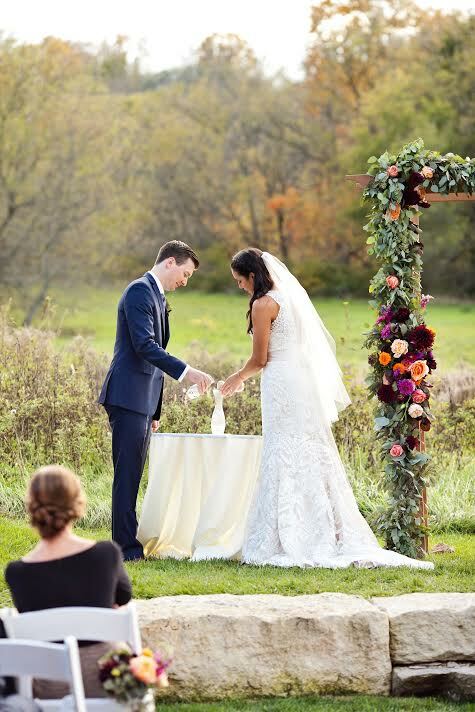 Jewish ceremonies traditionally include family members carrying the chuppah canopy – a symbol of hospitality and unity. Reader – The reading of a poem or scripture passage is a special moment that’s easy to incorporate within a marriage ceremony. Looking for something even shorter? Siblings can offer a simple blessing or piece of advice to the couple. Ring “Warmer” – Who says the Best Man must hold your wedding rings? He’ll already have a lot of responsibilities that day. Appoint your brother or sister with the bands, and when the time comes, have them present the rings to your officiant. When it comes down to it, each wedding – just like each family – is unique and personal. There’s no ‘right’ or ‘wrong’ way to involve your siblings on your wedding day. And for many, friends truly have become their nearest and dearest, like family! We strongly advise couples to be 100% certain when appointing important roles for your wedding day. Do what feels right to you and your fiancé – and your vision will come together for the most perfect celebration of your forever. To see how Marquette Avenue Events can help you find the perfect role for your siblings and most importantly, assist in the planning of your dream wedding please visit us at www.marquetteavenueevents.com or call us at 312-585-7265.